Ford was born as Leslie Lynch King, Jr. on July 14, 1913, at 3202 Woolworth Avenue in Omaha, Nebraska, where his parents lived with his paternal grandparents. His father was Leslie Lynch King, Sr., a wool trader and son of prominent banker Charles Henry King and Martha King. His mother was the former Dorothy Ayer Gardner. Dorothy separated from King Sr. just sixteen days after her son's birth. She took her son with her to the Oak Park, Illinois home of her sister Tannisse and her husband, Clarence Haskins James. From there she moved to the home of her parents, Levi Addison Gardner and his wife, the former Adele Augusta Ayer, in Grand Rapids, Michigan. 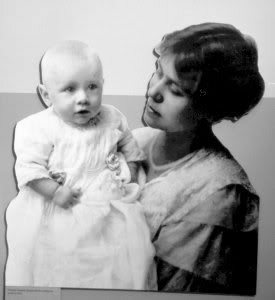 Dorothy and Leslie King divorced in December 1913; she gained full custody of their son. Ford's paternal grandfather Charles Henry King paid child support until shortly before his death in 1930. Gerald Ford later said his biological father had a history of hitting his mother. James M. Cannon, a member of the Ford administration, wrote in a Ford biography that the Kings' separation and divorce were sparked when, a few days after Ford's birth, Leslie King threatened Dorothy with a butcher knife and threatened to kill her, Ford, and Ford's nursemaid. Ford later told confidantes that his father had first hit his mother on their honeymoon for smiling at another man. After two and a half years with her parents, on February 1, 1916 Dorothy King married Gerald Rudolff Ford, a salesman in a family owned paint and varnish company. They then called her son Gerald Rudolff Ford, Jr. The future president was never formally adopted, however, and he did not legally change his name until December 3, 1935; he also used a more conventional spelling of his middle name. He was raised in Grand Rapids with his three half-brothers by his mother's second marriage: Thomas Gardner Ford (1918–1995), Richard Addison Ford (born 1924), and James Francis Ford (1927–2001). Ford also had three half-siblings from his father's second marriage: Marjorie King (1921–1993), Leslie Henry King (1923–1976), and Patricia Jane King (born 1925). They never saw each other as children and he did not know them at all. Ford was not aware of his biological father until he was 17, when his parents told him about the circumstances of his birth. That year his father Leslie King, whom Ford described as a "carefree, well-to-do man," approached Ford while he was waiting tables in a Grand Rapids restaurant. The two "maintained a sporadic contact" until Leslie King, Sr.'s death. Ford was born and baptized Leslie King, Jr. His father was a drunk who began beating his mother almost immediately after they were married, and they were quickly divorced. When she later remarried a salesman named Gerald Ford, the future President took his stepfather's name, and became Gerald Ford, Jr. As a Boy Scout, he earned the rank of Eagle Scout. Born in Omaha, Nebraska, to Leslie Lynch King and Dorothy Ayer Gardner King. Ford was first named Leslie Lynch King, Jr. But his parents separated two weeks after his birth, and Dorothy King moved to Grand Rapids, MI to live with her parents. Ford was born on July 14, 1913, in Omaha, Nebraska as Leslie Lynch King, Jr., being the son of Leslie Lynch King and Dorothy Ayer Gardner King. His parents separated two weeks after his birth and his mother took him to Grand Rapids, Michigan to live with her parents. On February 1, 1916, his mother Dorothy King married Gerald R. Ford, a paint salesman. The Fords began calling their son Gerald R. Ford, Jr. but this name became legal only on December 3, 1935. Aged 13, Ford knows that Gerald Ford Sr., was not his biological father, but it lasted until 1930 he met his biological father Leslie King, who made an unexpected stop in Grand Rapids. Ford grew up in a family with three younger half-brothers (Thomas, Richard, and James). He attended South High School in Grand Rapids, where he already showed is athletics skills, being named to the honor society and the "All-City" and "All-State" football teams. As a scout he was ranked Eagle Scout in November 1927. He earned money by working in the family paint business and at a local restaurant.